Oklahoma Region sanctioned the race without the aide of NEOKLA. Oklahoma Region left the Midwest Division, SCCA and joined the Southwest Division. Major improvements were made to the track. New, and lasting personalities made their debut. The Grand Prix had its first fatal accident. Dramatic changes were made to the track by the AMBUCS and the City of Ponca City. 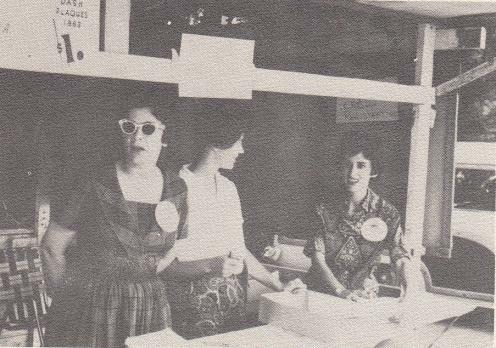 In the March Gazette, Race Chairman Johnny Walker reported, “Those people (AMBUCS) are, without a doubt, the most pleasant people to work with. They have done everything we could ask and more. This year the pits will be blacktopped and large. The communications as foolproof as can be...This should be a real fabulous race week-end.” Underground telephone lines to each of the corner stations were installed. Many tree branches were trimmed off to enhance spectator viewing. 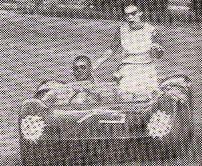 Eloise Norris drove David Dooley's Alfa Romeo Guilietta at Ponca, her first Divisional Race. She would go on to be one of the top SCCA women drivers of the Sixties, and would become the Executive Steward of the Midwest Division. 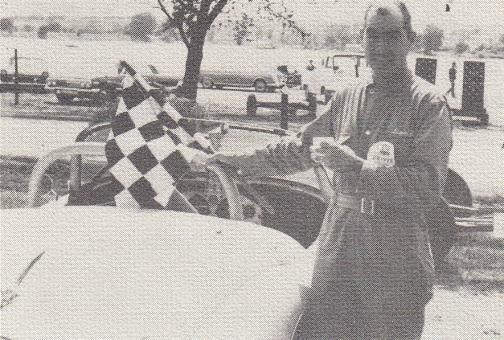 Doc Foerster also drove in his first Divisional race at Ponca in 1963, in a Porsche. Doc would move to St. Louis later in the year. Moving back to Oklahoma City after completing his medical residency requirements, Doc would race many years at Ponca and was deeply involved in the 1970 dispute with St. Louis Region that cancelled that year's PCGP. 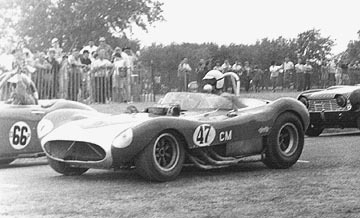 On a somber note, the first driver fatality happened in 1963 at Turn Two when Dr. Earl Pearson Jr. struck a tree in his Sunbeam Alpine. 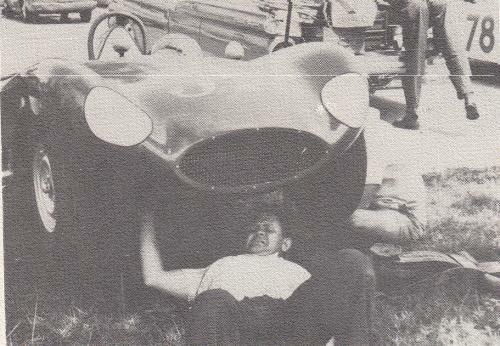 “One accident marred Sunday's running when Dr. Earl Pearson Junior of Little Rock, Arkansas, driving a Sunbeam Alpine, lost control on the second lap of the second race and hit a tree. Pearson died of multiple injuries in a Ponca City hospital several hours later. 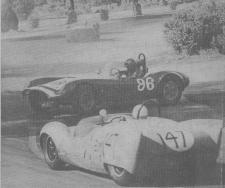 The second race was restarted after the accident with Tommy Allen of Oklahoma City driving a Porsche in the lead. 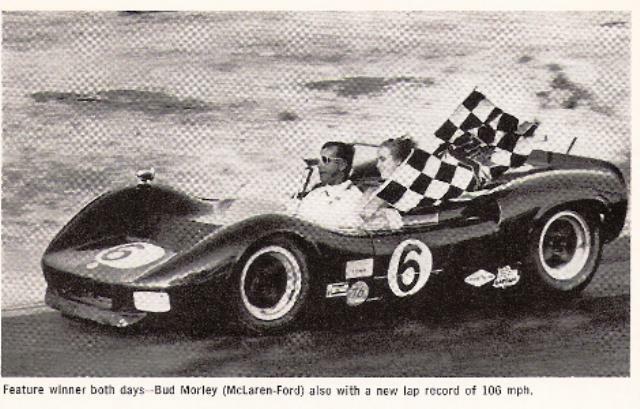 D.W. Forster, piloting a Porsche was second and Eddie Kimmel of Oklahoma City third. Foerster and Kimmel passed Allen but Foerster dropped out of the race because of engine trouble leaving Kimmel victorious,” the Daily Oklahoman reported on June 10. In a decision announced recently, A. W. Bud Berg, Chief Steward, Southwest Division, has banned all GT cars from competition on road courses in the Southwest Division. This decision will affect only cars that are unclassified by G.C.R. Therefore Ferrari 250 GT, Maserati GT, and other such high performance cars are unaffected, as they are in fact, Sports Cars. However, the last bastion of “poor man's racing” has crumbled. No longer can a family man of limited means race his Fiat 600, his Morris Minor, his Volkswagen, his Renault, his Volvo, ad infinitum. This writer admits that from a spectator's viewpoint this is of no great importance. Also, there are not very many GT drivers in this area. Even so, this is still another step away from a "fun" sport that enthusiasts can take part in without a massive financial outlay. As everyone is well aware, many changes have been initiated since Circa 195l. No one objects to the safety improvements...roll bars, approved helmets, fire resistant garments, etc. These things have added to the sport, and the extra cost is more than offset by the increased safety. Not too long ago, club racing was still a lot of fun for everyone concerned. Today club racing is a thing of the past, With this latest change another small group of drivers are forced to ether buy a different machine or drop out entirely. In my humble opinion, the sport cannot afford to lose these people. There were GT cars competing at Ponca city in the past two years. They were not involved in any accidents either time. There has been only one accident involving a GT car at Oklahoma City since the first race in 1958 and it was of no consequence I would suggest that rather than eliminate these cars rules should be formulated regarding suspension Improvements, etc. These regulations should concern safety only. Engine modification are not of too much importance, as weight, gearing, and so forth preclude any vast performance improvement. The major exception, of course, are cars such as the Austin Mini-Cooper. Out-and-out competition cars such as these, even though they meet GT body configurations, should compete on a performance basis as do the Production Cars, not engine displacement. This could be worked out. I sincerely feel that some attempt to preserve GT racing should be made. I have been misquoted a good many times, perhaps this is because of my weak, unmodulated voice or my shy retiring manner, but never in such grandiose example of journalistic drivel. True, I instigated the supplementary rule .for the Ponca City Races, excluding GT cars. It was aimed directly at the family car, designed and commonly purchased to drive on the public highways on such mundane errands as taking the kids to school, picking up the family groceries and in general, providing an economical means of transportation. Some of these were mentioned, Morris Minor, Renault, and the ad infinitum. (Is this last a variant of the Issetta?) 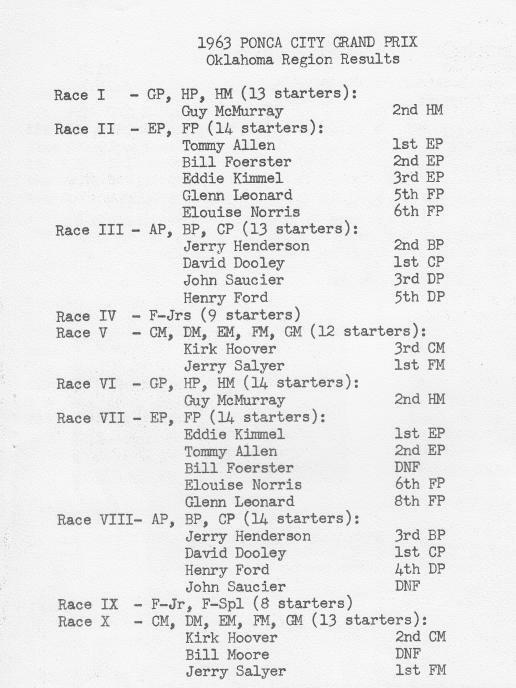 I and after conference, other officials of the Ponca City Race did not feel that this particular race course was forgiving enough to subject, these “family men of limited means” to the rigors of this unusually tricky road course, and the attendant, (many times multiplied by the soft marginal suspensions), danger to themselves as well as their competition. When queried on the subject by the writer, I told him, as I told all others who asked, that I did not feel that GT (as described) cars had a place on the PONCA CITY course, and they would not be allowed to run THERE. There may be other courses in this division where I will invoke the same edict, but certainly not all of them. Incidentally, Ben, my title, for which I have labored long and hard is not “Chief”, but Executive Steward, Southwest Division"
Ben did apologize to some extent in a later Gazette, but the damage had been done. Both members were to leave the Oklahoma Region. 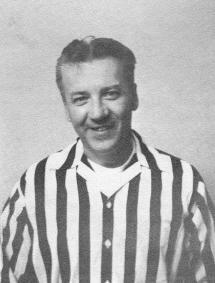 Bud moved to Texas where he continued as Southwest Division Executive Steward for another year. Ben just faded away, and was last seen cruising Classen Boulevard in his MGA. By the end of 1964, Oklahoma Region rejoined the Midwest Division. 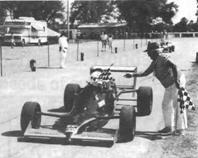 The Ponca City Grand Prix was awarded the July 4th weekend date previously held by Lake Garnett, Kansas.